Downloading a casino client is exclusive to PC users with a large amount of storage space but this leaves Mac players out and can be time consuming. No download casino sites offer an array of keno games which works with Flash so you can play the game via your web browser. No need to head to your local pub or club to play – start up your laptop, desktop or even smartphone or tablet to play real money keno with a click or tap of the finger. No download casinos are also known as instant play, web browser play, or Flash casinos and simply allow players to access the sites via their browser of choice. Firefox, Chrome, Safari and other web browsers are compatible and all you have to is type in the URL, or if you’re reading this article follow the links to the secure web casinos listed in the table above. The sites won’t crash your computer or see viruses installed as they use the latest modern encryption technology to protect you from the moment you enter your details to register an account and when you make an easy deposit using Australian methods, until you logout and leave the site. The sites above each offer at least one keno variant, but we detail their exact games below so you can decide which Flash casino is best for you. We have done our research and played at quite a few online casinos to come up with the following sites as the best options for real money keno players. When we visited each site, the padlock in the URL toolbar appeared confirming the latest SSL and TLS encryption has been implemented. This ensures signing up with our personal details is safe, and making deposits and withdrawals with our financial details is all secure and protected from hackers. This ultimately means playing at these sites with real money is as safe as handing your real cash to a keno attendant. Jackpot Keno: Created by 1×2 Gaming the minimum bet available is $0.01 and the maximum bet is $36. There’s 20 balls drawn from 80 and up to 15 eligible to be picked. There’s also a funky soundtrack to accompany gameplay and a progressive jackpot to be won in real money mode. 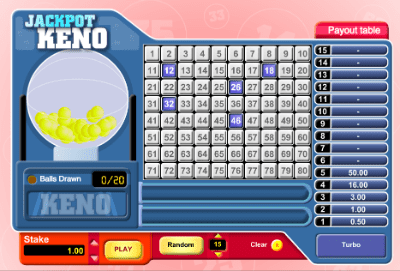 Keno: Developed by Microgaming, you will find this variant at many online casinos. There’s a minimum bet of $1 and a maximum of $10 per game. There’s also up to 15 spots to choose, with 20 drawn from 80. Keno: Another traditional variant, this title is by 1×2 Gaming and is quite similar to their Jackpot Keno – there’s just no chance to win a progressive jackpot. Play Turbo to speed up gameplay and play more games in three minutes than the one you would at a land-based casino. Kenotronic: If you like electronic dance music and dabble in your share of keno, this variant if for you. Featuring a hard style soundtrack players can pick up to 15 keno spots, with 20 drawn from 80. There’s a minimum bet of $0.05 and a maximum bet of $25. Keno Kick Off: This is truly a unique keno variant and you must try it if you want to mix gameplay up. There’s a minimum of $0.25 and a maximum of $20, with only 40 numbers set on a soccer field. Players can pick up to 10 spots and 10 soccer players will run out with soccer balls landing on the numbered spots. Overall, this title by 1×2 gaming is quite unique. Video Keno: This title, by Multislots, features graphics which makes it appear as if you are filling out a real keno form. There’s 80 numbers and you can pick up to 10 spots – click ‘buy cards’ to play. There’s a minimum bet of $0.10 and a maximum of $5 per card and you will find this keno option is closest to land-based keno. Monkey Keno: This is a new variant from Microgaming which shows keno is still a relevant casino game. There’s a cheeky monkey hanging around while you pick up to 15 numbers from 80, with 20 drawn. There’s a minimum of $0.10 and a maximum of $10 here too. Keno Lab: Keno Lab is another unique keno variant by 1×2 Gaming but only the theme has really changed. The keno game is set in a lab and up to 15 spots can be picked from 80, with 20 drawn. Theres a minimum bet of $0.25 and a maximum bet of $20 per game. Guts online casino only offers one keno variant, but it is a popular title. Keno: Microgaming’s variant is available at Guts online casino with the same minimum of $1 per game and maximum of $10 per game. Find a huge range of unique casual games at Karamba is a popular keno site offering unique titles from NeoGames. Keno: A traditional Keno game with up to 15 spots eligible to be chosen from 80 numbers. Then 20 are drawn with a mysterious soundtrack creating a suspenseful atmosphere. Theres a minimum bet of $0.20 and a maximum of $10 per game. 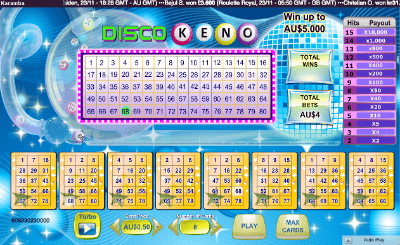 Disco Keno: Disco Keno is a stunning variant where keno is mixed with bingo, with up to eight cards eligible to play at one time. You can play one to eight cards at a time with a minimum of $0.25 and a maximum of $10 per card available. Keno Deluxe: Keno Deluxe is similar to the Keno variant listed above, but the colour scheme is different. The minimum bet is also higher at $0.50, while the maximum bet is the same at $10. Keno Blast: This title is again similar to the Keno game but the balls are cannonballed onto the keno layout, with the additional option to speed up gameplay. There’s a minimum bet of $0.50 and a maximum of $10. 3 Wishes Keno: Is a unique themed keno game with an arabian soundtrack. There’s standard keno gameplay with 10 spots from 80 eligible to be picked, but there’s also a 4x multiplier for wins if you reveal two genie symbols, and an 8x multiplier for three genie symbols. The minimum bet is $0.50 and the maximum bet is $5.